Using each of these in isolation (for example only using persuasion theory) will bring you some but limited success. It’s only through the seamless integration of all five study areas that we truly say we finally combine head and heart together both consciously and unconsciously in the way we act and sell to all future prospects. Salecology can guarantee long-term success with immediate impact on your top line. Salecology covers the following 5 areas. Neuroscience is used to develop our ability to influence decision-making, the buying process, empathy, rapport, communication, the sales process and customer service. Salecology reviews brain functionality to understand the signals that put people into a “fight or flight” mode when prospecting, and to learn how to adapt different strategies for objection-handling or negotiating a sale. Neuroscience offers us an unparalleled viewpoint to enhance our understanding of both sides of the sales equation – i.e. the sellers’ and the buyers’ – and therefore achieve results that are mutually satisfying. All buying situations contain both business process and personal psychology. Most sales people emphasise the former. In this part of Salecology, you will learn how to adapt your selling style to the customer’s personality type and deliver a great buying experience. By understanding personality and human behaviours you will be able to create trust instantly and influence individuals on a different level. 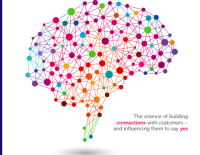 Using psychology in sales will satisfy both the rational and emotional parts of the brain. Think in terms of buying cycle, rather than selling cycle. All human beings have the same mental triggers that drive actions. In order to influence and understand your customers, you need to know what those triggers are and how to utilise them in your message. We like to believe that we are immune to outside influences, but studies find that our surroundings play a key role in the decisions we make. Peer pressure affects aspects of everyone’s life. 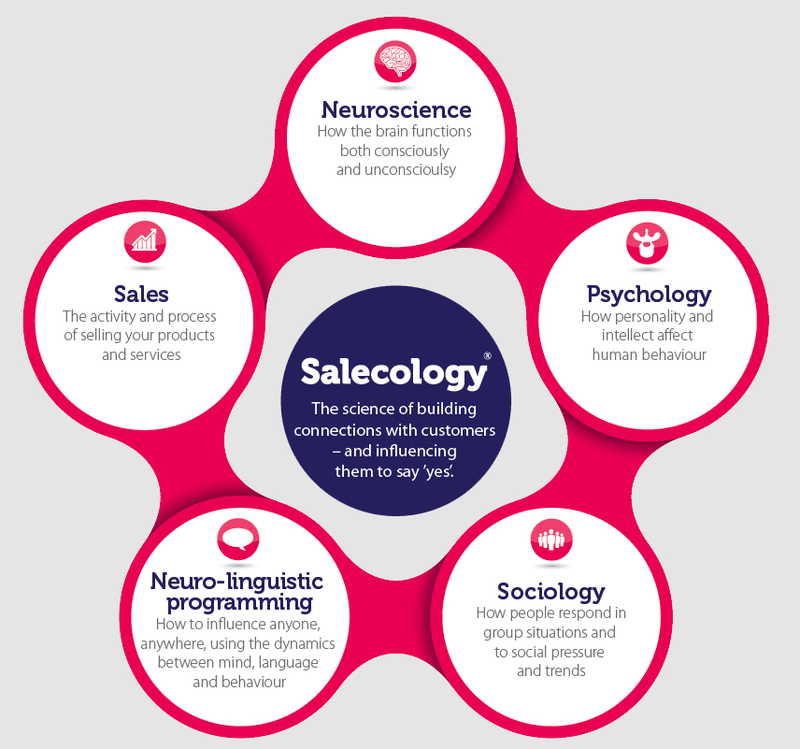 Salecology utilises the study of sociology to learn how to apply sales influence through trends, cultures and social networks as well as how to create the right atmosphere that will drive the customer to buy. Selling to one or two people requires one set of skills, however by paying consideration to group dynamics, the sales professional will also be able to sell more successfully to organisations, boards, panels or decision-making groups. Language is an amazing tool that determines how people interface and communicate with others. By using specific language that brings out certain feelings in people, sales professionals can develop emotional connections and trust with their customers that are necessary in sales interactions and marketing. By understanding the dynamics between mind, language and behaviour the sales person will be able to adapt their selling style to communicate with customers in a deeper, more meaningful way. Discovering how people receive and interpret information will enable them to ask questions and present solutions that will ignite customers’ passion. This part of Salecology also teaches how to change people’s state of mind. This can be used to put the sales person into a “High Performing” state, as an example or to put the customer into a “receptive or buying state”. Over the last decade the way that people shop and buy has fundamentally changed. While salespeople used to be the first points of contact for prospective buyers, the internet is often the primary research tool. They gather data and information, compare and contrast products and pricing, long before speaking to a salesperson. Knowing this, the sales strategy and approach need to adapt, and the salesperson’s skills and capability must now be much more than a “walking brochure”. Within the Salecology programmes, the areas of neuro-liguistic programming, psychology, neuroscience and sociology are combined. You will learn to use various tools, models, processes and techniques to use in the sales and marketing of your products and services.